At your arrival in Managua. Transfer to Granada, the ancient capital during the colonial times. Dinner not included. Riding adventure to reach an old farm. We choose our horses for three days of riding in flat landscape, lake beaches, sandy islets, rangeland, swamps, wild and thorny sunburned savannahs. Crossing the swamp, we arrive at Lake; enjoy various gallops in beach shore. Traditional lunch at a fisherman house. Ride to north along the beach. We go to an island to install our tents. In the afternoon discovery of a biotope particularly rich in birds, in boat through the lagoon. Note: Night: Dinner at the camp or at village. Overnight in tents of 3 for 2 people. In horse: 5 hours – 17 kms, dip in the lake without special supervision, but no danger, boat trip for birdwatching about 2 hours. 6:00 Breakfast at the island. By boat to El Paso, we observe waterfowl, very active at dawn. We found our horses for a ride in a mixture of spiny savanna and flooded plains. Back to the cattle ranch, where we have lunch. We set up our camp in the huge old building´s balconies built in 19th century. In the afternoon we ride a horse searching cattle. Traditional farming techniques (only large areas of natural pastures, unfenced, cows are herded. (Before sunrise: Possibility to participate in hand-milking cows) 6 a.m. Traditional Breakfast. We take the horses to leave the farm. In a Detour we reach the lake galloping. We continue along an old railway line which finally brings us to the old Granada Steam Railway. Lunch at lake. We lay off our horses. We take a microbus and reach Masaya Volcano. Visiting volcanology center, the crater spewing hundreds of tons of gas per day, pre Columbian site of human sacrifice, various panoramic views, and a lava tunnel. Discovering saddlers’ artisans’ art, guitar manufacturers, local markets, its historic center and its magnificent cathedral colonial, with the presence of horses still useful, they are everywhere in the city, pulling carriages and wagons and even “routes” passenger bus. Cultural equestrian event in the evening, in a village fete around Masaya or if no match dates, visit to a horse barn (stud farm) for demonstration of dressage (dance steps of a horse!). We take rested creoles horses. Ride to the plateau of White Villages through a bucolic landscape, shaded walkways, craft villages and scattered settlements. In Catarina, visit to gardens, flowery streets, and viewpoint to crater and the blue water lagoon Apoyo, meeting potters of San Juan de Oriente, a neighboring village. Then we take the top edge of the crater and finally went down to the shore of Apoyo lagoon (7km). Upon reaching the edge of the lagoon, appetizer, day or moonlight swimming, in the blue and warm waters. Saddled our horses for the day. First we take the steep path, leaving the crater and reaching Diriomo viewpoint, visit to and old colonial style church. Next ride to a farm by shaded paths and scattered villages, where we have a typical lunch. Ride until reach the entrance of the Mombacho volcano. 4×4 transportation leads to the summit. Walking in altitude (1.500 m) in a forest “of clouds” (cloud forest) around the crater. Ride to a farm near to the volcano. Ride in the middle of coffee and cocoa plantations, meeting of a group of women farmers in her daily activities. Lunch at a farm. Departure by minibus to the Pacific coast. 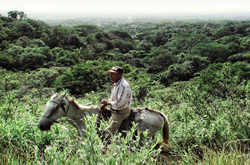 We meet the horses and go to a Wildlife Refuge through a tropical dry forest. La Flor is one of the world´s seven beaches where sea turtles Paslama come massively to spawn. Depending on the season. Always worth trying your luck and enjoy the wait in this magical place. Dinner at Ostional. Overnight in tents. Note: Night: in tents, Horse riding: around 10 km in morning and 15 km in afternoon. We saddled and ride out towards the village “Los Tortuguillos” by a semi-humid tropical forest, populated by bands of howler monkeys. Visit on the way of a mysterious pre-Columbian site. Picnic at Los Manzanillos beach. Then, reaching back La Flor refuge by rocky coves and small beaches. Walking around the coast (seabirds, pelicans, frigate birds and eagles). At ranger’s station, we found again our horses to gallop back to the hostel. 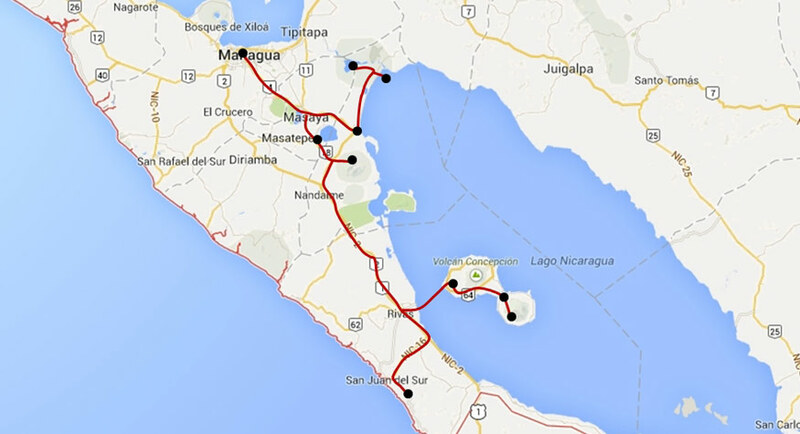 Take the road to San Juan del Sur and Granada. Dinner in the old center of the city, and night in the hotel, of a charming colonial style. Dinner and overnight at lodge, near San Juan del Sur. As 3 or 4 centuries ago, we are in Granada, jewel of colonial architecture, in the process of being listed as a World Heritage Site by UNESCO. The market of fruit, vegetables and spices, colonial churches and narrow colonial streets, ride in old horse-drawn carriages or by bike to visit some distant points (the old train station, a shoe factory, pure factory and to the cemetery). During lunch we visit a restaurant and a little peculiar hammocks workshop. Lunch is served by young deaf… opportunity to learn some basic signs of this language. In the afternoon, visit the islands of the archipelago of Granada, slowly sailing in a small boat or kayak among hundreds of islets to go for a last swim of the sun in a haven of greenery and water. Dinner in the pedestrian street. Good by to the ones of the group who finish their 12-day trip. Note: Riding and walking all day with different tours, 15 kilometers total.